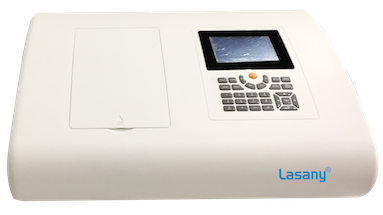 DOUBLE BEAM UV-VIS Spectrophotometer with more accuracy and flexible requirements. The two detectors are used measure sample and reference respectively and simultaneously for optimizing measurement accuracy. It has wide wavelength range satisfying requirement of various fields, such as biochemical research and industry, pharmaceuticals analysis and production, education, environment, protection, food industry etc.
? Wide Wavelength range, satisfying requirements various fields. From world famous measurement methods all add up to high performance and reliability.
? Parameters and data can be saved for user’s convenience. Glass Cell : 4 nos. Quartz cells : 2 nos. Instruments Cover : 1 no. Software CD : 1 no. USB Cable : 1 no. Software Manual : 1 no. Standard Curve Up to 10 Standard sample may be used to establish a curve. Four methods for fitting a curve through the calibration points :Linear fit. Linear fit through zero, Square fit and cubic fit. at high WL. And it minimizes the degradation of UV sensitive samples. This mode may be used for time course scanning or reaction rate calculations. Abs v/s time graphs is displayed on the screen in real time, Wait time and measurement time up to 12 hours may be entered with time interval of 0.5,1,2,5,10,30 seconds and one min. Post-run manipulation includes re-scaling, curve tracking and selection of the part of the curve required for rate calculation. Rate is calculated using a linear regression algorithm before multiplying be the entered factor. © Lasany International.All rights reserved.